First act. Waiter´s start. Hidden theater. Schorsch Bross takes care discreetly and effusively of the guest´s well-being. He is perceived as a normal waiter. Second act. Something wrong with this waiter? The uncertainty. Slight change of persona manifested in a glance, a movement or a remark. 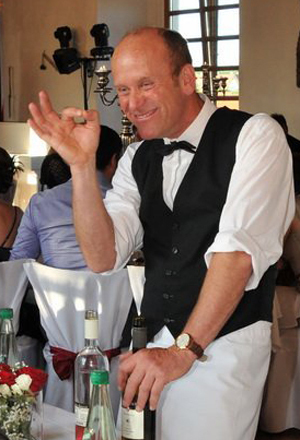 The guests start getting the feeling that there must be something wrong with this waiter. Third act. The waiter shows his true face. Improvisation theater. Verbal and non-verbal play evolves between Schorsch Bross and the guests, created and maintained by Schorsch Bross´spontaneity, body language, quick-witted response and slapstick. Fourth act. The unleashed waiter. Show – time. Finally, Schorsch Bross starts his stage show. His quick wit, his proximity to the audience, his excellent artistic performance thrill his audience. What did Schorsch Bross do as waiter at the tables?